To the Rescue', war in the Sudan, 1885. 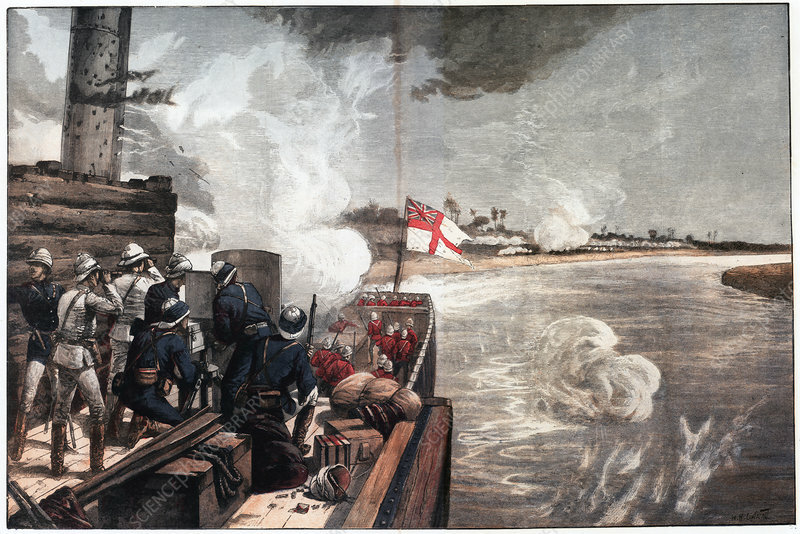 British gunboats engaging the enemy on the way up the Nile to relieve General Gordon, besieged by the Mahdi at Khartoum. The British gunboats under the command of Lord Charles Beresford arrived on 28 January, two days after the fall of the city and the massacre of Gordon and the garrison. The gunboat is fitted with a Nordenfeld machine gun. The officers and men are wearing Solar Topees (pith helmets). From The Illustrated London News. March 1885).